IT WOULD certainly have made a lively topic of debate during the two-and-three-quarter-hour journey home to Basildon. Louie Leighton edged his travelling companion Richard Hillgrove 2-1 on the final black to clinch the sixth leg of the Cuestars Under-21 Silver Tour in Bournemouth. But whether the 15-year-old fluked the last ball at the Greenbaize Snooker Club or played a cracking safety shot with the chance of a pot depends on whose camp you are in. Whatever the intent, Leighton replaces his practice partner from Basildon Snooker Club at the top of the rankings. And that incentive spurred the teenage on. Leighton, who also won the first leg in Salisbury, said: “It was very even but with him being top of the rankings, it just made me want to beat him even more. “I didn’t play that well in the group stages but when I got into the semis against Nat (Kidner), I played well. Home player Kidner had qualified for the knockout for the first time this season. He then dispatched former rankings leader Riley Ellis (Wilts) 2-0 in the last-eight before going down 2-1 to Leighton. Will Forster (Gosport) made his third semi-final exit of the season, losing 2-0 to Hillgrove. Leighton has a five-advantage over Hillgrove. Ellis is seven points further back in third. ROUND-ROBIN GROUP A: 1st, Richard Hillgrove (Basildon SC); 2nd, Callum White (Waterlooville Sports Bar); 3rd, Nat Kidner (Greenbaize, Bournemouth); 4th, Dean Russell (Waterlooville Sports Bar); 5th, Harry Wilson (Waterlooville Sports Bar). ROUND-ROBIN GROUP B: 1st, Riley Ellis (147 SC, Swindon); 2nd, Shane Kearns (Jesters, Swindon); 3rd, Kaine Petty (Salisbury SC); 4th, O’Shay Scott (Chandlers Ford SC); 5th, Mason Wilson (Academy, Basingstoke). ROUND-ROBIN GROUP C: 1st, Louie Leighton (Basildon SC); 2nd, Will Forster (Mayfair, Gosport); 3rd, Samuel Laxton (Waterlooville Sports Bar); 4th, Zak Truscott (Waterlooville Sports Bar); 5th, Oliver Cooper (Frames, Coulsdon). QUARTER-FINALS (12 points): Hillgrove 2-1 Laxton, Forster 2-1 Kearns, Kidner 2-0 Ellis, Leighton 2-0 White. SEMI-FINALS (15 points): Leighton 2-1 Kidner, Hillgrove 2-0 Forster. FINAL (25/18 points): Leighton 2-1 Hillgrove. 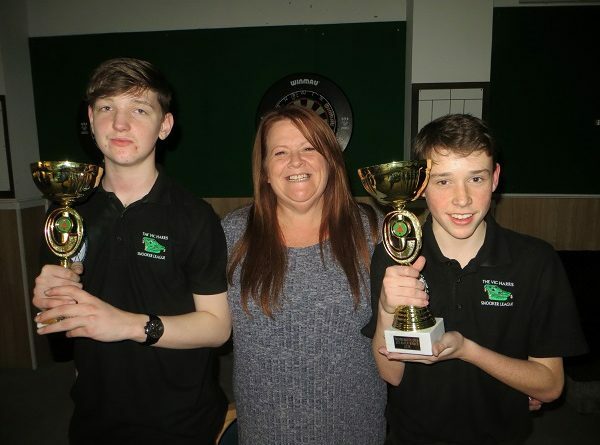 From left: Richard Hillgrove, Greenbaize club owner and event sponsor Debbie Ealy, Louie Leighton.